Apple today introduced the new Mac Pro with eight processor cores and a new system architecture that delivers up to twice the performance of its predecessor. The new Mac Pro combines two of Intel‚Äôs new 45 nanometer Quad-Core Xeon processors running up to 3.2 GHz, powerful new graphics and up to 4TB of internal storage to offer the ideal system for creative professionals, 3D digital content creators and scientists. The standard 8-core configuration starts at $2,799. 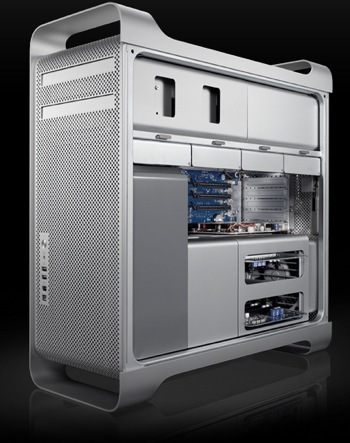 The new Mac Pro comes standard with the ATI Radeon HD 2600 XT graphics card with 256MB of video memory. The Mac Pro includes a new PCI Express 2.0 graphics slot that delivers up to double the bandwidth compared to the previous generation, and supports the latest generation of graphics cards from NVIDIA, such as the NVIDIA GeForce 8800 GT with 512MB of video memory, or NVIDIA Quadro FX 5600 with 1.5GB of video memory and a 3-D stereo port for stereo-in-a-window applications. With support for up to four graphics cards, the new Mac Pro can drive up to eight 30-inch displays at once for advanced visualization and large display walls. The Mac Pro is the most expandable Mac ever, featuring four internal hard drive bays with direct-attach, cable-free installation of four 1TB Serial ATA hard drives, totaling 4TB of internal storage and support for two SuperDrives. With optional 15000 rpm SAS drives that can deliver up to 250MB/s of RAID 5 disk I/O performance, the Mac Pro is ideal for film and video editors. Combined with SATA or SAS drives, using an optional Mac Pro RAID card offers the ultimate data protection and disk I/O performance on the Mac Pro. The Mac Pro is easily and conveniently accessible in front and back so users can connect external devices with five USB 2.0, two FireWire¬Æ 400, two FireWire 800, optical and analog audio in and out, dual Gigabit Ethernet ports and a headphone jack. The new aluminum Apple Keyboard now ships with the Mac Pro and built-in Bluetooth 2.0 makes it easy to reduce cable clutter with the optional Apple Wireless Keyboard and Apple Wireless Mouse. The new Mac Pro is shipping today and will be available through the Apple Store, Apple‚Äôs retail stores and Apple Authorized Resellers. *Based on estimated results comparing a preproduction 2.8 GHz 8-core Mac Pro with a 2.66 GHz Quad-Core Mac Pro running professional applications like Maya, modo and Logic¬Æ Pro. **Testing conducted by Apple in December 2007 using a preproduction 2.8 GHz 8-core Mac Pro with a 2.66 GHz quad-core Mac Pro. All systems were configured with 4GB of RAM. Results are based on the STREAM v. 5.6 benchmark (www.cs.virginia.edu/stream/ref.html) using OMP support for multiprocessor-compiled builds. All systems were configured with 8GB of RAM. Performance tests are conducted using specific computer systems and reflect the approximate performance of Mac Pro.